The Upstate Soundscape returns tonight after 2 weeks off the air due to the host traveling abroad in search of insanely weird and out-there vinyl. 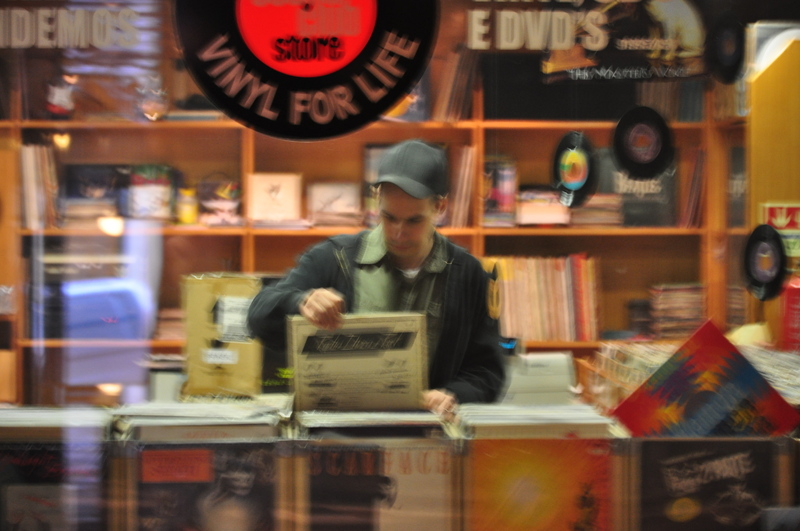 After scouring (almost) every record shop in Western Europe, Needles will have quite the show in store for you tonight. So tune in tonight at 10pm to 91.3FM WBNY to hear some killer experimental records from far away places. And speaking of killer vinyl, don’t forget that this Friday is Freeform Friday at Merge with the Vinyl Retentives. We might have a fellow Vinyl Retentive in studio with Needles discussing the event, along with playing some tracks. We’ll also preview two shows happeing this week, one tomorrow night at the Jungle Gym featuring Pregnant Spore and other noise acts, and one this Sunday at Unity Church featuring Wooden Cities. Tonight on the Upstate Soundscape we will continue checking out the releases that we have been reviewing for our [2011 in Review] section. We’ll hear tracks from the reviews of the past week including Chapels, SIGHUP, Bob Ohrum, throuRoof, and Kyle Bobby Dunn. We’ve got another week or so of reviews left and we’ll preview some of them including the one for All of Them Witches’ new album Breathers vs. Drivers. The review for Breathers vs. Drivers is scheduled to post tomorrow, while All of Them Witches will also play a show this Saturday at Mohawk Place. Also going to preview the show going down at The Vault this Friday with the KBD Sonic Cooperative (no connection to Kyle Bobby Dunn), ChinaUFO, Malaria Control, Fluxmonkey, and Jason Zeh.For those of you planning on attending this show, make sure you head down to Merge afterward for Freeform Fridays with me and the Vinyl Retentives. All vinyl, no cover, and cheap PBR tallboys. Should be a good way to close out the night. The Upstate Soundscape starts at 10pm on 91.3 FM WBNY. Stream at WBNY.org.